skisouthYou guys want to know about which mountains are open and with how many slopes & trails, visit the SNOW REPORT page. Today we are talking snow and other news. The Photo of the Day is of 4″ of snow and heavy snowmaking at Canaan Valley this morning. For the last couple of days I have been stuck on the word “transition”. Monday morning I spoke about Monday being a day of transitioning from mild, yuck temps and weather (and slope conditions at a couple of open ski areas) to Tuesday morning when temps were 20-28° colder than the previous morning. Snow also began falling later on Monday and other than a short period where it stopped…it has been snowing since…and at least for the last 24 hours. Even the normally “no snow Foscoe” which really had no snow on the ground when I left the office on Tuesday afternoon, is now reporting 1.4″ of new snow in the last 24 hours (with all of that accumulating since 6pm yesterday). The CoCoRaHs reporter from up on Seven Devils is officially reporting 3″ of snow as of 8am and it is still snowing. We confirmed the snow at Snowshoe was inaccurately reported by the NWS station. As I was browsing each of the webcams this morning, I couldn’t help but notice that the website was running a (little) sluggish. Not bad at all considering we are getting bombed with 2,527 active users per MINUTE this morning. That started mid-day on Tuesday as several television stations were broadcasting our LIVE feeds. We want to welcome Producer, Dan Levin from WXII 12 out of Winston-Salem for joining our network of stations that do show off our mountains to their audiences. WXII is an NBC affiliate and part of the Hearst Media Group. WFMY out of Greensboro, NC is featuring us right now on the Facebook feed. The crazy thing is we had 249,489 video sessions on Tuesday (according to our Wowza server) and I have to believe we will blow past that today. WNCN NewsChannel 36 out of Charlotte is home for our own Meteorologist, Brad Panovich and they shared two of our LIVE feeds last night via their Facebook page. They featured the King Street Camera in Downtown Boone and it saw 43,034 views alone. They also featured the LIVE feed from the Beech Mountain Base Camera for 30 minutes last night and it has seen 33,485 views. 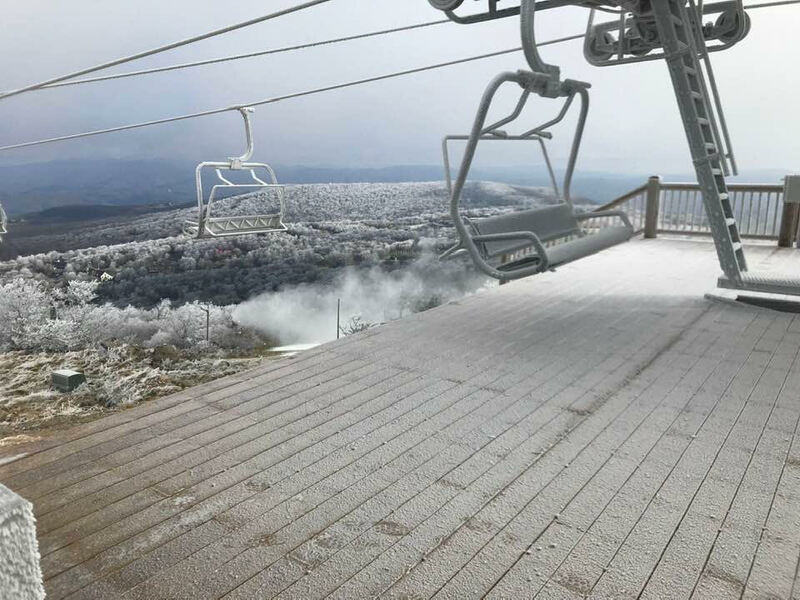 14° Appalachian Ski Mountain – 1″ of new snow being reported. App is closed until Friday. 6° Beech Mountain – 3″ of new snow. Still open with 2 slopes and not using their new lifts. 13° Cataloochee Ski Area – they are open with 6 slopes from the top of their mountain. They are making snow like crazy as well. I have to share the video sent in by Tammy Brown this morning. It isn’t the best view from inside the groomer, but it does give you a few seconds to see a little of what it’s like to drive through the snowmakers. Not the greatest video, but I’m always griping for resorts to send ANYTHING…so here ya go! 6° Canaan Valley Resort – They picked up 4.3″ of new snow; 6.9″ over the last 48 hours and they are now at 14.8″ on the season. Canaan Valley will open December 15th. 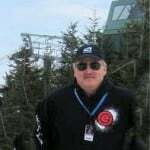 8° Snowshoe Mountain – We spoke with Shawn Cassell on the mountain and he confirmed via the snow stake that Snowshoe officially had 6.5″ of new snow. 14 trails are open as well. 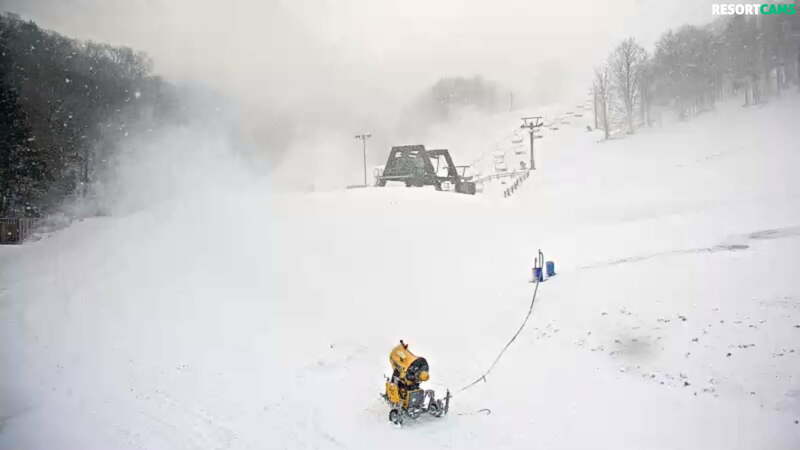 14° Winterplace Resort – They picked up 2″ of new snow and they are also bombing the slopes, prepping for opening any day now. 18° Wisp Resort – 4″ of snow has fallen in the last 24 hours according to the official CoCoRaHs reporter there in Garrett County. They are also bombing the slopes and will open soon. 11° Wolf Ridge Resort – 1″ of new snow and they are making snow. I know a lot of you guys are asking about the web camera up there. It seems their camera may have died. (It’s not one of ours!) However, we are speaking with their team about getting one over there pronto. I sure wish that each of the ski areas would make it mandatory to report natural snowfall. I know it may be hard for our readers to believe, but there are many that never even mention natural snowfall numbers. We have to rely on local connections in many cases where there are not CoCoRaHs or NWS reporting stations. Previous articleBoy howdy! What an amazing weather-swing over the last 24 hours!